"Whether driving through the ford in Rice Creek, taking a slide down Sliding Rock or camping under the stars you can spend days relishing in the historic landscape and roaming through the rolling hills of Victoria Bryant State Park." 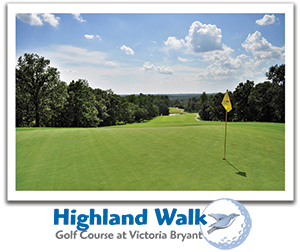 Golfers will enjoy the park’s superbly-conditioned Highland Walk Golf Course with full amenities and reasonable rates. Memberships, golf packages, and tournament pricing are available. The course is built on steep, rolling hills with broad, crowned Bermuda fairways leading to generous, sloping Bermuda greens. The course’s Bluebird Cottage is available for overnight golf packages.